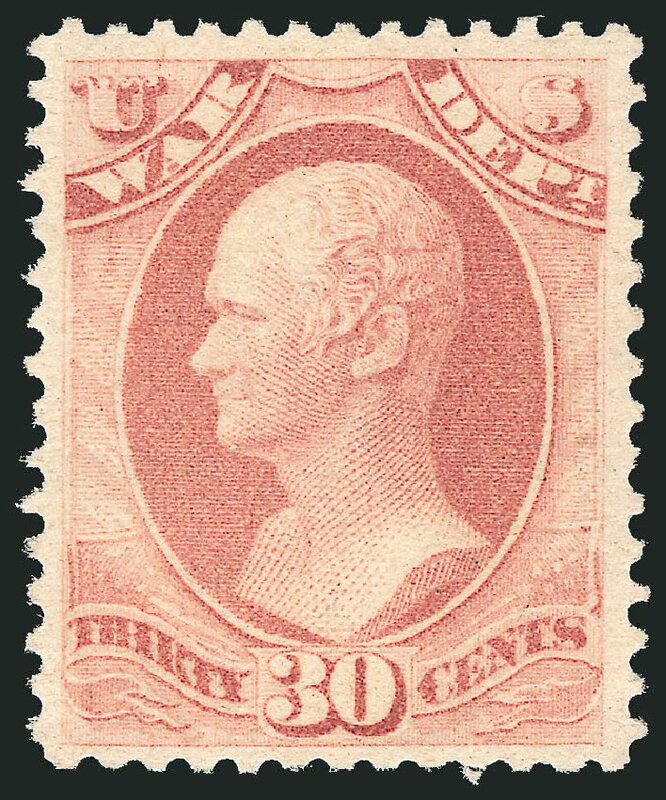 USA (Scott O120) 1879 WAR 30¢ ROSE RED SOFT PAPER Fresh, very fine, original gum, lightly hinged. Cat value $225. 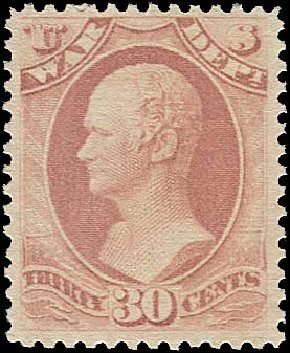 War Dept., 1879, 30¢ rose red (Scott O120), o.g., lightly hinged, vivid and fresh example, attractive, Fine to Very Fine. Scott $225. Estimate value $150 – 200. 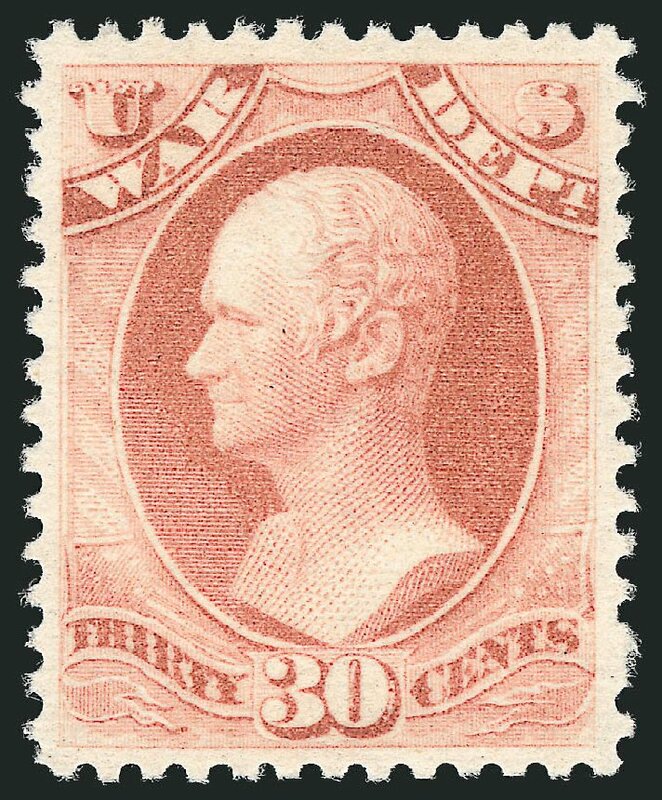 USA (Scott O120) 1879 WAR 30¢ ROSE RED SOFT PAPER Fresh, fine to very fine, original gum, lightly hinged. Cat value $225. 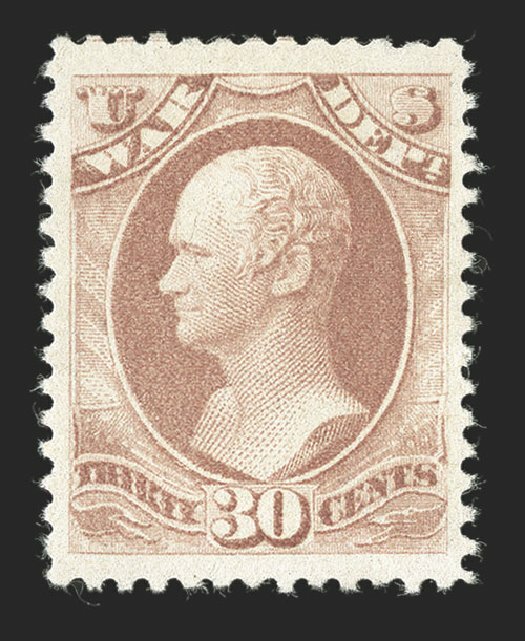 War Dept., 1879, 30¢ rose red (Scott O120), o.g., previously hinged, magnificent well centered stamp with robust color, simply gorgeous, Extremely Fine, 2014 P.F. certificate graded XF-90. Scott Stamp Values $475 in the grade of XF-90. 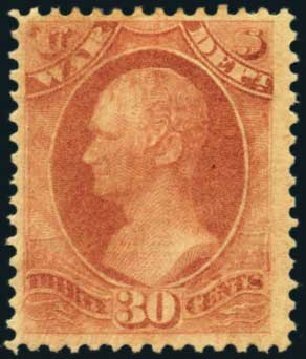 Scott $225. Estimate $350 – 500. 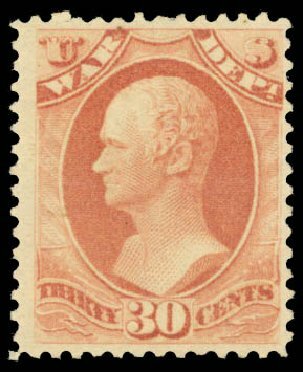 U.S.; Official, War Dept., 1879, 30¢ rose red, #O120. O.g. (h.r. ), fresh and Fine. 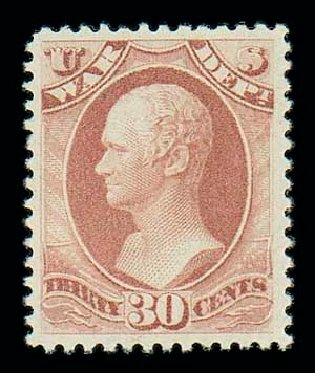 Scott $225. Estimate value $70. 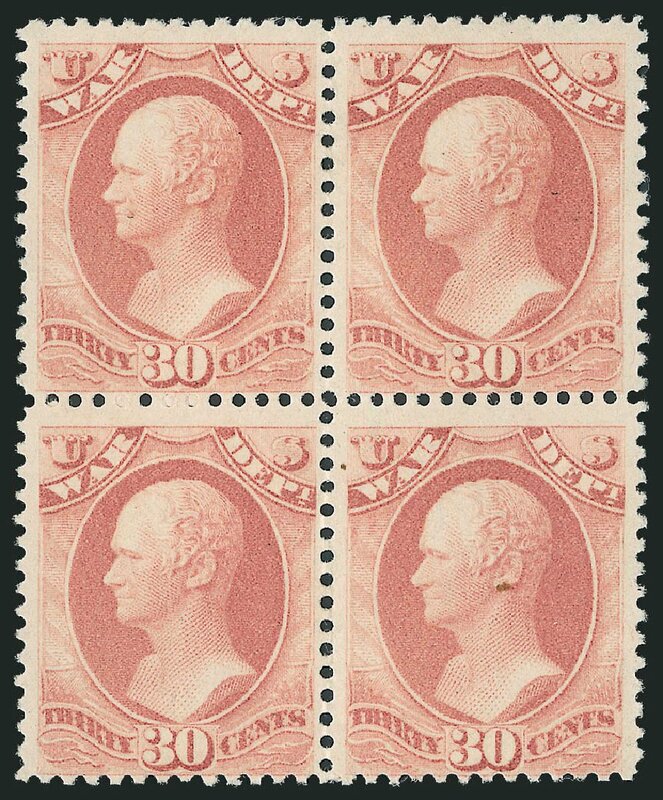 Scott #O120, 30c War, on soft porous paper, uncharacteristically well centered and margined, fresh color, o.g., current certificate mentions a small gum crease at bottom, extremely fine; clear 1999 PSE certificate and a 2012 PSE certificate (VF-XF OGh; SMQ price $325.00). 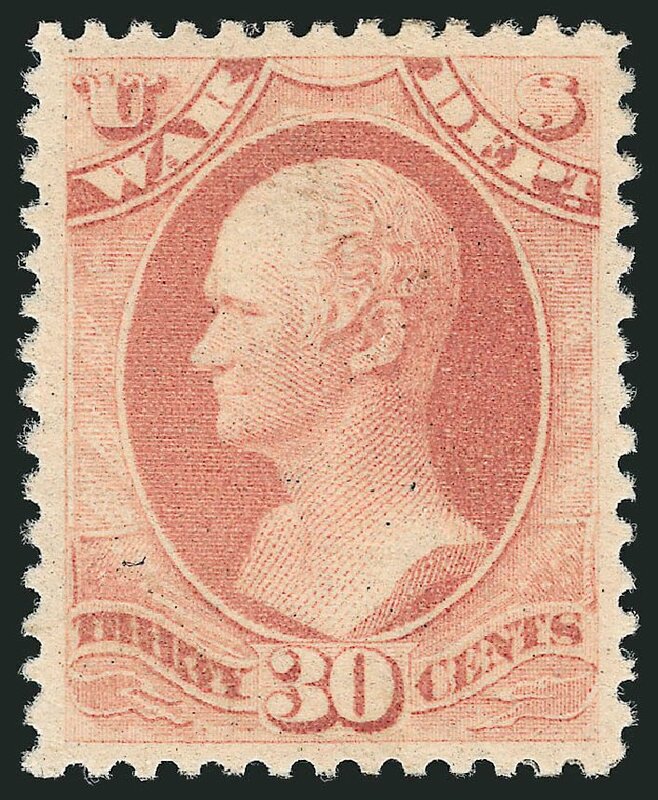 U.S., War Dept., 1879, 30¢ rose red, #O120. O.g., Fine. 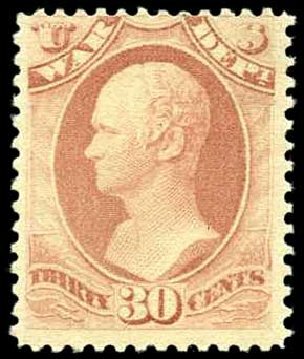 Scott $220. Estimate value $45. 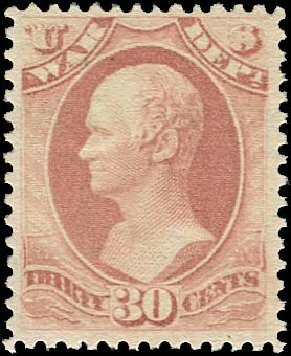 War Dept., 1879, 30¢ rose red (O120), well centered, o.g., LH, fresh and Extremely Fine. 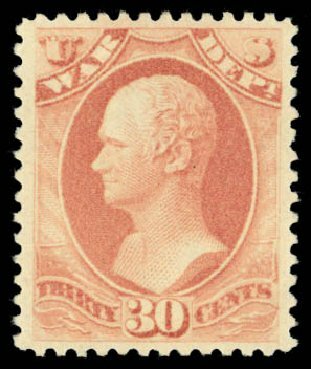 Scott value $220 Expertization: 2002 P.S.E. Certificate for a block of four.